Will the counselor tell me what to do? There are several areas in which counseling can help you. One is to clarify a problem. Another is to identify steps to resolve the situation and to develop a plan of action. 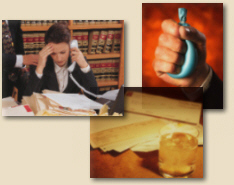 The counselor can also help you to handle a crisis situation and assist you in sorting through your options. Write down your questions and concerns and bring the list with you. Sometimes it is hard to remember all the problems or issues, especially in a new situation. Bring any notes, documents, or records that will help you remember and describe the problem to the counselor. include how long you've had the problem. Also include similar problems you have had in the past and how you resolved them. Bring a list of all current medications with you describing the type of medication, dosage and reason the medication was prescribed by your physician. Where appropriate, you may be asked to bring family members or other significant people who are involved with the problem to the first session. Each Session is typically 45 to 50 minutes long. However, you will be asked to arrive approximately 15-30 minutes prior to your first session to allow for paperwork. This depends upon you and the problem you are experiencing. Many concerns can be resolved quickly, in just a few sessions. Your counselor can work with you to reach these short term goals. The counselor, if needed, can also help you to resolve more complex issues with extended treatment. Will insurance cover my counseling sessions? Many insurance companies do cover counseling. Please refer to our 'Fees & Insurance' page for a listing of some of the insurance and employee assistance programs that are accepted or you may contact the office. We will be happy to assist you in finding out what insurance benefits are available to you.